We build custom homes in Cornelius from budget to luxury and everything in between, so you can get the home you envision. 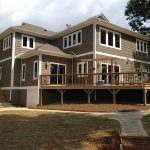 It is a common misconception that all custom homes built in the Cornelius, North Carolina area end up being on the high end of the luxury price tag scale. Here at Chad Goodin Signature Homes, we believe that everyone deserves the chance to have the home they want. We have the experience and efficiency in place to be able to build custom homes for lower budgets, as well, so you can enjoy a home that was custom designed to suit your needs regardless of what you have to invest. Our design team will carefully listen to what you want to accomplish and then provide you with the options that will fit your needs and budget. You can choose the features that mean the most to you, and we’ll do our best to make it happen. There are an almost unlimited number of options and possibilities when building custom homes, and our team will walk you through how to get as much as possible for your budget. Of course, if you do happen to have an unlimited budget, or something in between, we can help you, too. We are experienced with high-end luxury custom homes, and our staff will spend the time with you to be sure you’ve seen all the options that would make your home everything you are hoping for. When it comes to building custom homes, there are two things that are important: enjoying the process and loving the results. With our dedication to exemplary customer service and attentiveness, we are confident you’ll be glad you chose us. We go above and beyond, including making your moving day a bit easier by ordering catered food for you, so you can focus on moving into your home. Feel free to contact us to learn more and to get started with building the home of your dreams. At Chad Goodin Signature Homes, we can build beautiful custom homes in Cornelius, Mooresville, Davidson, Huntersville and the surrounding Lake Norman area of North Carolina.